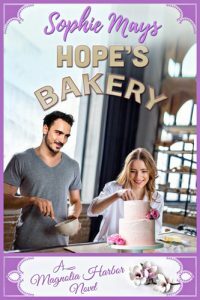 The book started with the idea of Hope and her bakery. Hope was a fictionalized character with a combination of inner emotions that I've helped friends with in the past or experienced a bit myself. Rylan's obsession with sea life was a gentle nod to my son's love of the same. Hope's mom came to be because I have never witnessed anything more selfless than seeing my mother and mother-in-law step up to help me in parenting. Families are amazing (even the ones who you don't get by blood). And Michael…well let's just say that I believe that there are incredible men out there. When we let people be their whole selves and don't pigeonhole them into stereotypes of what a “man” or “woman” is suppose to be, you will usually find that the whole human before you is kind, loving, goofy, patient, and just as much in need of love as you are. The sunlight had just reached that perfect time of the morning where it filtered in through the windows at the back of the bakery, causing the stainless-steel worktops to gleam like glass. It was quiet; there would not be another human inside the building for at least another hour. The small green radio hummed a low tune, and the atmosphere in the room was peaceful and calming. Outside the charming little shop, majestic live oaks draped with Spanish moss swayed lazily to the beat. Hope Nolan stood in front of the tall, double-doored refrigerator, her top lip clamped between her teeth as she studied the contents inside. Her fingers gingerly tapped on the handles of the doors in rhythm to the upbeat tune that started to play. She loved this song and mouthed the words as her motivation gained steam. She pulled an ever-present hair tie from around her wrist and secured her caramel hued hair into a neat knot at the nape of her neck.